When Erin posted her theme for the Round 2 of the Cocorico paper piecing bee on Flickr, I was thrilled. She asked for paper pieced sewing machines. Well it just so happens.....I designed a Singer Featherweight block almost a year ago. I was so happy to finally have a reason to put the sewing of this pattern at the top of my "to do" list! I purchased my White 1964 machine for my birthday a few years back. 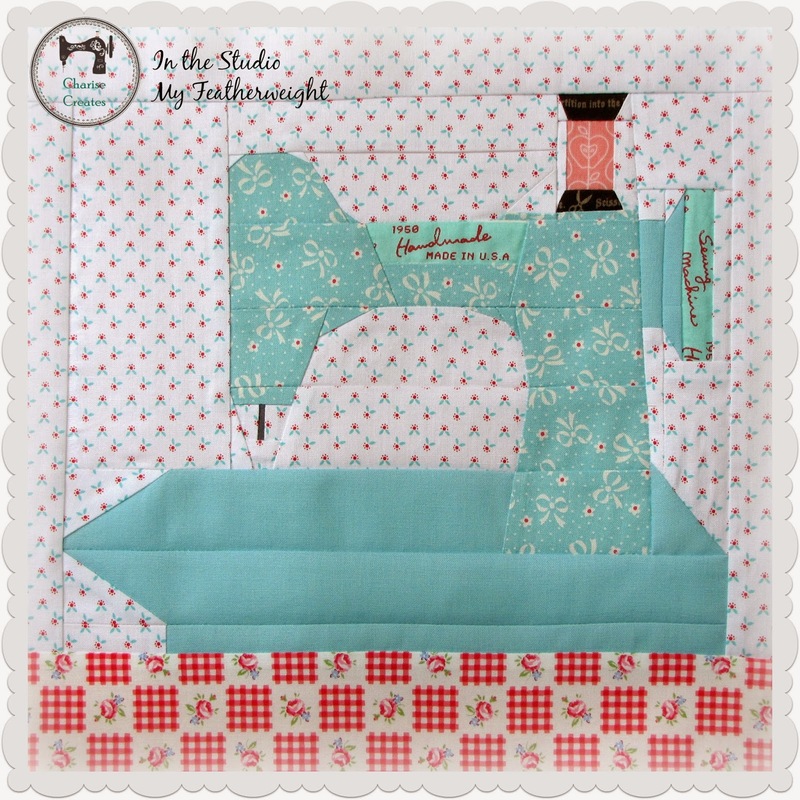 It is my go to machine for piecing and pretty much everything else I sew. It is a sturdy little work horse and also so pretty to look at! The Featherweight pattern is available in my Etsy and Craftsy shops! Oh my goodness! The block is beautiful Charise! I love it! Thank you so much! I have a white Featherweight too! Mine is a 1961 and she is so sweet to sew on. Thanks for sharing. 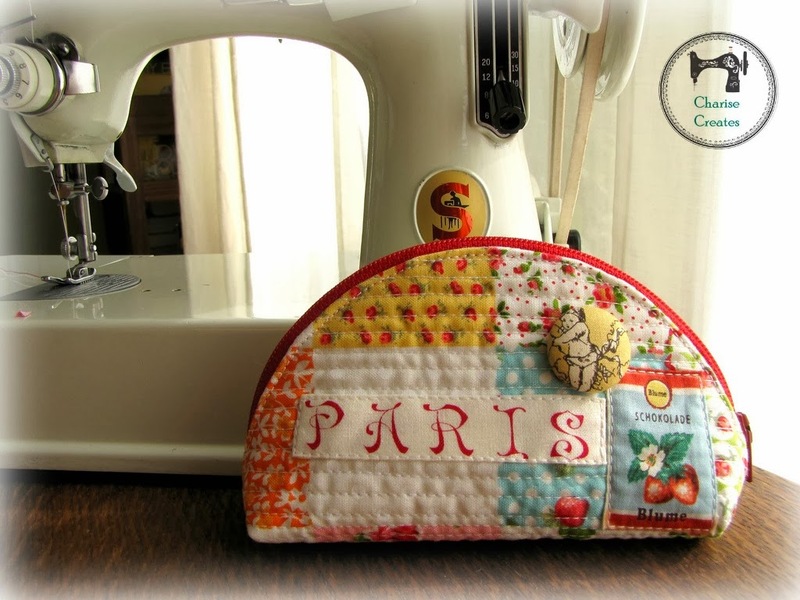 OMG I'm in love with this blog with a sewing machine!! Perfect colours and the machine has just a perfect shape! Ohh when I will have time to try out paper piecing! Very nice! I thought at first it was a sewing machine cover...but a wall hanging it cute too...but.. I just made covers for my machines and once things settle down for me with things I HAVE to do, I am going to buy your pattern and adjust it for a new machine cover! To cute to have that in my sewing room! Your paper piecing continues to amaze me. 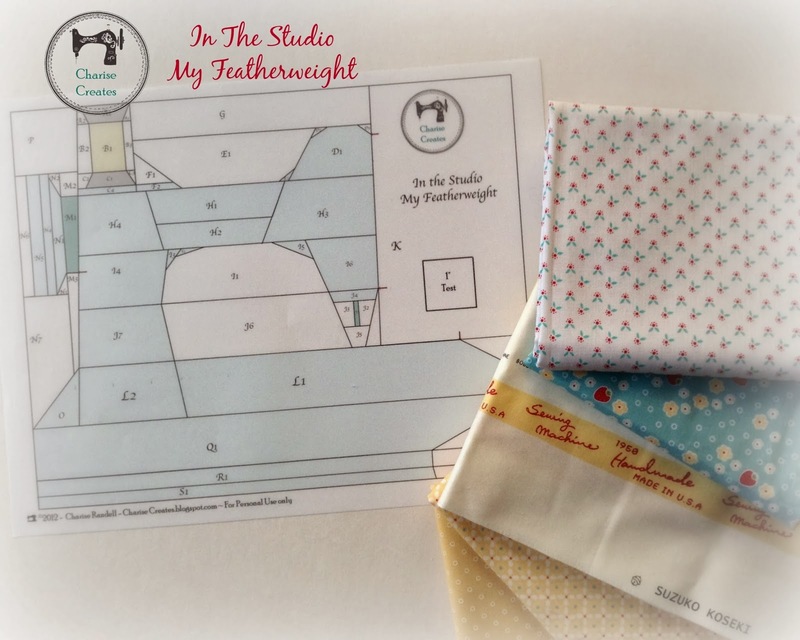 I LOVE your Featherweight block! I have only made one one paper pieced block ever, though, and it was a simple star. I'm guessing that your intricate patterns require a good bit of skill and experience to execute. Which of your patterns would you recommend for someone just starting out? Oh my gosh I am dying over this block. Love your fabric selection, too. And the machine! I have been craving a 1964 white/celery machine for a few years! And just this past weekend a flea market dealer refused to sell me a perfect black Featherweight...he got cold feet. Ok, I'm heading over to the Etsy link now to check it out.